A minor rift was healed today. My immediate family (not the family I married into) consists of me and two brothers - Ian who is 10 years older than me and Bryan who is 8 years older. For obvious reasons, I wasn't close to either of them as a child - they were at school, then at work by the time I was old enough to figure out why they weren't home with Mum and me during the day. I adored Ian because he was endlessly patient and kind with me, but Bryan and I were constantly bickering, which drove Mum and Dad mad sometimes! As I grew up and started work, the relationship between my brothers and I changed for the better, as I guess they now saw me as nearly an adult, and not a little brat. They got married and had kids, and I was a different kind of Auntie for those nephews and one niece. I rode motorcycles, travelled overseas with my first husband, divorced him, married another man, and never had any kids myself. In later years they told me I was the coolest Auntie of the lot! As time went on, we saw less and less of each other - you know how it is - "weddings and funerals and we must keep in touch". Well, a distant cousin has been doing a family history on our mother's side, and my brothers and I have supplied her with as much information as we had (which wasn't much). She recently sent me three copies of a photocopied version of an old diary, asking me to give two copies to my brothers. Rather than post them to Ian and Bryan, I thought this would be a good chance to catch up. So I invited them and their wives (no kids - they are all grown up and gone their own ways now of course) over to our place for afternoon tea. That was today, and I have just thanked our cousin by email for indirectly bringing my brothers and I together. The six of us had a very happy afternoon, talking mostly about family stuff (poor Ken must have been bored, but he was a good listener), and laughing over shared humor. SIL Robbie was born in the UK, and still has a very strong accent even after half a century in Australia. She was telling us about the time she went into a bakery to buy some bread rolls and the girl behind the counter was listing the types available. When she came to the Knot Rolls she pointed and said "They're Knot rolls" which puzzled Robbie, who replied "If they're not rolls, what are they? They look like rolls to me". The sales girl apparently glared at her and said "Smart arse!" Robbie couldn't figure out what she'd done wrong! We all cracked up laughing over this anecdote! From left: Wilma, married to Ian (in blue shirt), me, Bryan (who HATES having his photo taken) and his wife Robbie. Of course this photo and the people in it won't mean anything to most readers, but there are some who will know who I've been talking about, and will be curious to see the family that I rarely talk about! Just because we don't see much of each other, doesn't mean there is anything wrong - we've always got on well as a family. But today we agreed that as we are all getting older, it would be nice to meet up more regularly. I offered my home as our meeting place, and I think they are all happy about that as I put on a good spread for afternoon tea, whereas my SILs don't cook much in the way of cakes and biscuits these days. I am glad you are getting re-aquainted. It is so easy to let family just slip away. 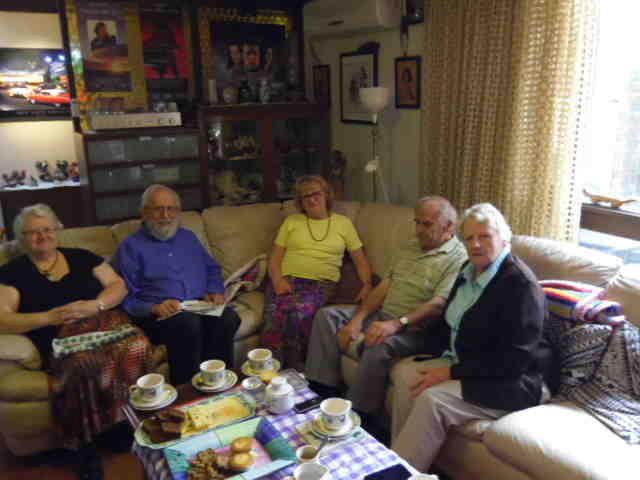 We had a delightful lunch and afternoon with Harv's family on our recent trip to Toronto. It is fun laughing over old family jokes and remembrances. How lovely. I would absolutely hate to think that my children didn't remain close in the future. Glad you had a nice time together. Gina I think that is a purfect moment to remember forever....well done to your cousin, she must be thrilled herself.